Continuing from the previous post where I talked about how you can calculate the cost of a trip to Spiti valley; in this article I will provide a few tips on how you can reduce that cost and keep it to a bare minimum. Traveling to Spiti valley on budget to be honest is not really that difficult. The entire circuit goes through a very well populated area and is properly connected by public transport. A common thought is that traveling to Spiti valley will require a lot of time of and money which is not really true. With careful planning, you can easily travel to the valley in a week’s time without letting it burn a hole in your pocket. How you can do so is what I will talk about in this article. If you were wondering about how much it is going to cost you to travel to Spiti valley; then I recommend that you take a look at the two articles below. Tourism in Spiti valley has been on rise in last few years. Thousands of people travel here each year and what was once considered a destination for adventure junkies and motorcycle enthusiasts now gets considered even for family vacations. 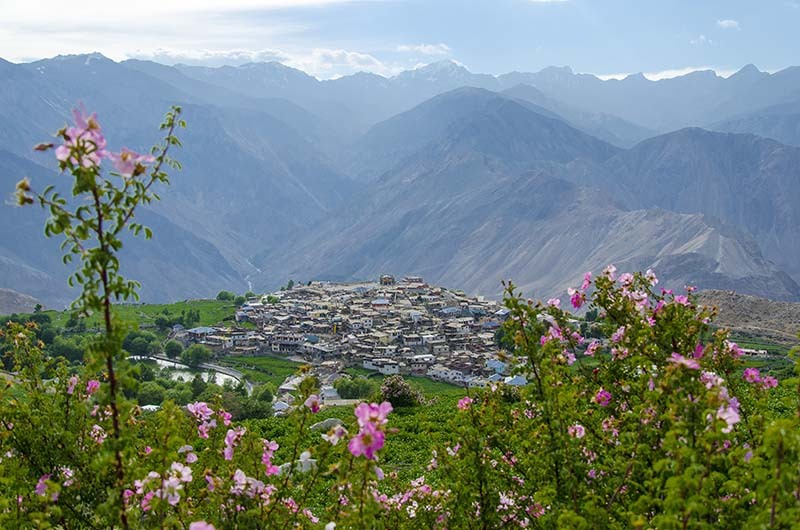 With that being said, the fact however still remains that Spiti valley is still a remote region and a trip here demands that you set aside at least a week’s time. It cannot be your usual weekend trip to a nearby hill station. Hence, the cost factor here is actually a direct result of the number of days spent on the road. If you look at it in that proportion; Spiti valley will actually not cost you any more than any other tourist destination. All that you need to do is work towards reducing the daily cost and mentioned below is how you can do it. The biggest expense of your trip if you go by personal vehicle will be of fuel. It doesn’t matter if it was a car or a motorcycle, the money you will end up paying for gas will be almost half of your total expenditure. If you were on a strict or shoestring budget, the best way to save this money is to travel to Spiti by either bus or shared cabs. As I mentioned previously in the article, places here are well connected and there are regular buses from one town to another. From both, Shimla and Manali, a bus leaves every day for Kaza that you can board. These are ordinary HRTC buses that locals use to travel with and the ticket price is very nominal. Almost half of your money will be saved; and another upside would be to travel with the locals and get a taste of true Spitian life. For more details, please take a look at How to Travel to Spiti Valley By Bus and Shared Taxis. I have explained here the entire journey breaking it by days and places and how you can manage it by public transport. After the local bus service, this is the most cost effective mode of travel available in Spiti valley. These run on a daily basis to all major towns and places on the way. Fare is almost the same as a bus will cost you and you can easily find these taxis from Bus stands. Majority of the locals use these to travel around and do not really rely on buses. This means traveling in the months of April, May and October. You can actually go before April and after October as well but that would make it a winter trip; and the weather will be too cold. If you want to travel to Spiti when it isn’t freezing and keep it within a budget, then these three months would be best in terms of accommodation. Most of the hotels and guest houses shut down during peak winters and April is when they open up for business. There are not many tourists around at this time and your chances of getting a good deal on accommodation will be great. Hotels will be more prone to lowering their prices and allow more than 2 people in the same room. With the increase in tourism, more hotels and guest houses continue to come up on Spiti circuit each year. Finding a place to stay is not difficult at all, no matter the month of your travel. If however you booked your stay in advance, chances are that you will just end up paying more. A better way would be to reach your destination first, find a hotel per your liking and negotiate an on the spot deal. Spiti has ample amount of budget hotels and you will easily be able to find a hotel for Rs. 500 – Rs. 700 a night. Another great place to stay at would be the HPPWD guest houses which never cost that high. For more details, please read HPPWD Rest House : Locations, Contacts, Charges & How to Book. Here is the fun part. Once you cross Shimla and then until Manali, there are really no fancy restaurants in between anywhere. For most of the journey, you will be traveling through a remote Himachal; villages or small towns where food cost will not be that great. At some places however like Sangla and Kaza, expensive restaurants too exist. There it entirely depends on you where you eat and how much you spend; but on a general note, Spiti is a place where you will find plenty of Dhabas and shacks to eat at. Your food cost in the end will not really come out to be too large. No I am not saying that you find a huge bike group of 25 members to ride with; but it always saves money if you have some other people accompanying you on the trip. For example, if you are on a motorcycle and have a pillion, then the fuel and accommodation cost will get divided in two. Same goes for traveling by a Car. The greatest expenditure will be of fuel and if you are in a group of 4-5 people, this cost will get divided. Accommodation cost too will get divided if you are traveling in a group of 3-5 people. I know it is not always an option and not everyone will have their friends joining in for the trip. In that case, you can try finding a travel partner online who can accompany you for the trip. Click on the Travel Partners link above in the menu and leave a post in our community forum. Someone else traveling on the same route can see your post; leave a reply and you can journey together. When traveling to a place like Spiti and that too on a budget, you really will have to be flexible at several places; and I mean it in terms of accommodation and meals. You cannot be too choosy or specific about things because sometimes that may cost you more than you can afford. At several places and several times; you will be required to work with what you got for reasonable rates. On Spiti circuit, you anyways just need a place to stay for the night as you will be gone the next morning so be ready to adjust a little. If you are on a severely limited budget than hitchhiking is another great option to move from one place to another. A lot of people travel to Spiti in tourist season and helping each other becomes a trend during this time. If you were walking on the road and put a thumb up asking for a ride; it is extremely rare that the person passing by will not stop. I have myself given lift to several people during my trips to Spiti valley and almost everyone who is able to does it. You will find a lot of Israelis in Spiti traveling this way. Even a lot of trucks travel by and I have seen a few people boarding a ride on one of the passing trucks. I hope the information above on making a budget trip to Spiti Valley was of help. If you have any further questions; please feel free to ask in the comments section below; or at our Community Forum; and I will be glad to answer. Hello we are planning on 20 may with family will rohtang pass gt opened by that time and we will travel from Shimla so can we go Manali also via rohtang on that particular time ?